We covered generating your Jilt DNS records along with some general guidelines in our article Can I send emails from my own domain? Here we'll take a look at adding the DKIM record to your Cloudflare domain host. 2. Select your domain name from the dropdown in the top left of the screen. 3. Click the DNS settings tab. 4. From the DNS settings page, use the fields below the search bar to create a new DKIM record. To start, we'll select CNAME from the first dropdown. 5. For Name, copy and paste the value from the Host/Name field (#1 in the screenshot below). 6. We'll use the next field (where it says "Click to configure") to enter the Value/Alias To value (#2 in the screenshot below). 7. 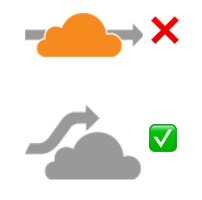 Leave the Automatic TTL (Time to Live) field as is - we'll stick with Cloudflare's default setting. Click Add Record to finish adding your DKIM record.